Sure, our first love will always be the trampoline. But every so often it’s nice to take a look at some of the other options for backyard entertainment that are available – after all, you have to do something while you wait your turn! Today we’ll be looking at six of the best jumbo games for outdoors, a really fun sub-class of backyard activities that are great for both the young and the young-at-heart. This article will present only reviews of items which cost more than $40 USD and less than $400 USD. This is a great wooden lawn game that’s based on (though legally distinct from) the board game Jenga. Players take turns pulling a block out of the tower and stacking them on top, with the loser being the first person to knock over the tower. The blocks are 7.5″ x 2.5″ x 1.5″ and the initial tower stands at over two feet tall, making this quite an impressive structure and a really fun backyard twist on a classic game. It does, however, present a couple difficulties. The first is that it has to be placed on some kind of flat surface, which might be a problem for some people depending on the layout of your backyard. 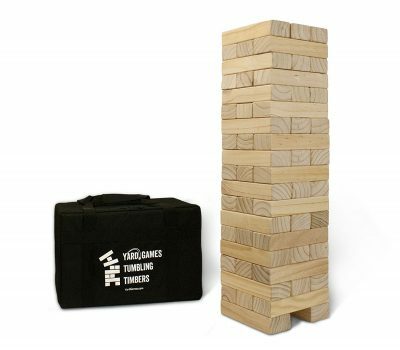 The second is that the blocks are made of thick wood, so it can hurt when the tower comes toppling down if you don’t get out of the way in time, meaning that this is not a game that young children should play unsupervised. Still, at only $80, this is an excellent choice for an all-ages jumbo game. 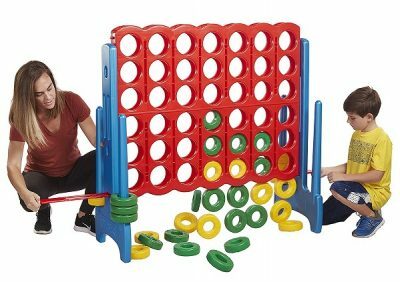 This is a jumbo Connect 4 set produced by ECR4Kids which is probably a much better choice for Kindergarten kids than the Tumbling Timbers. The set stands 46 inches tall (a little under four feet) and is made of very child-safe plastic in bright and exciting colors. It also has a weather- and fade-resistant design that means it can be used indoors or (as we at Trampoline Review Guide always prefer) outdoors. And one thing that makes this particular version of this jumbo game stand out as one of the best life size Connect Fours for sale is the easy-to-use and very functional game reset system and ring holders. All this and more is why our kids love this Jumbo 4-To-Score, but adults will probably find this one a little boring – after all, it’s just a slightly more novel version of tic-tac-toe. 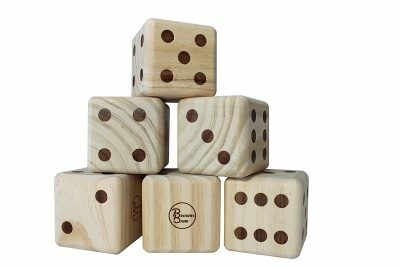 This Browns Bank-produced set of six oversized yard dice is designed for “Yardzee” (Yahtzee) and “Yardkle” (Farkle) and comes with laminated dry erase score cards for the same, but you can use them for anything from pen-and-paper RPGs to Liar’s Dice. At a size 3.5 inches cubed, these are much better than trying to use regular dice in a backyard or outdoor setting, as the latter often gets dropped and lost or rolls away in the wind. These dice are made of 100% solid pine and are sealed for durability in all weather conditions, with hard sanded edges to prevent chipping – pretty impressive quality for only forty dollars! Big dice are a backyard classic and this set definitely has six of the best giant dice for sale. 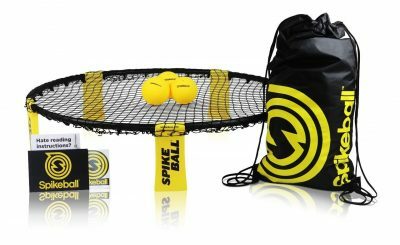 Most of the jumbo games we’ve looked at today have been larger versions of something small, but Spikeball is a smaller version of something large. It’s a lot like volleyball, but instead of spiking a ball over a net you spike it onto a mesh that looks like a mini trampoline for a fun and active sports game that’s become increasingly popular since it appeared on Shark Tank in 2015. The game is completely portable and the legs on the net fold up to make it easy to store, and the net is also adjustable so that you can make it more or less bouncy to match your level of skill. Spikeball is great for athletes (it’s part of the training regimen of the San Francisco 49ers, among other professional sports organizations) and is a fun and competitive game for anyone to play in their backyard. 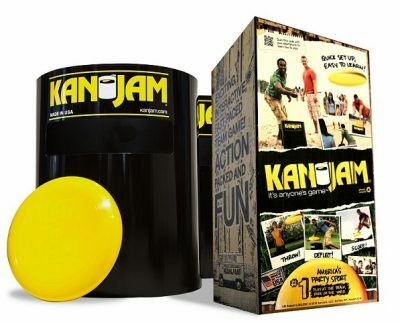 Kan Jam (which the company also stylizes as Kanjam or KanJam) is an outdoor game that might be a little too big for your lawn or backyard but which is perfect for the beach or park. It’s a frisbee game where two teams of two players each attempt to throw a flying disc into the opponents’ bucket, with various points earned for hitting it, “dunking” it into the top or getting it to fly into a narrow hole on the side. This game is a ton of fun – there’s nothing quite as satisfying as getting it into the slot and giving your team an instant win – and you’re sure to stay active throughout play. Better still, this is a game that’s just as much fun for kids as it is for adults, and it’s completely safe! Easily one of the best giant yard games for sale. 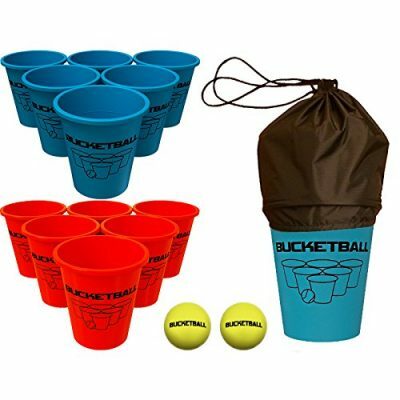 Bucketball is a bit like a giant jumbo game version of beer pong – but without the beer, of course. Each team has nine buckets in a triangular formation and two balls. If you land a ball in a bucket, that bucket is removed from play, and the first team to remove all the opponents’ buckets wins. One of the biggest advantages this game has over the other options in this list is that the buckets float, so the game is just as much fun to play in the pool as it is to play in the yard. The whole set is also extremely portable (and comes with a custom tote bag) and costs just $50, making this an excellent giant yard game for sale. Any of these giant yard games are great oversized games for outdoors, and maybe you have a favorite jumbo game of your own that we didn’t even cover here! If you’re looking for something a little different from a trampoline (heresy, we know), then giant outdoor games can be a great, cheap choice for kids and adults.